Subject: Description of Andros island. The island's flora and fauna. Windmills and Water mills. Archeology and culture. Description of 22 paths throughout the island. Other features: A map for each hiking route. Size: H 21 Χ W 13 cm. This beautifully illustrated guide details 22 hiking routes on Andros, including information about monuments, other points of interest as well as about services available along the way. The guide complements a series of voluntary activities undertaken under the auspices of the Andros Routes Project, aiming at preserving Andros nature and culture and maintaining its ancient paths. 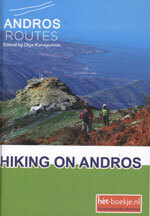 Our share of the profits from the sale of this guide will be donated to the Andros Routes Fund, specially created to finance the continued maintenance of Andros ancient walkways. 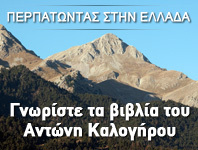 We hope this guide will help to make your hiking holiday on Andros a memorable experience.